Xioami Pattern Password Remove Tool is a small application for windows computer created by Kyaw Nyi Nyi, which allows you to remove the pattern lock, password lock from your Xiaomi smartphone. Xiaomi Pattern Password Remove Tool allows you to reset pattern lock quickly with it’s simple and intuitive interface. 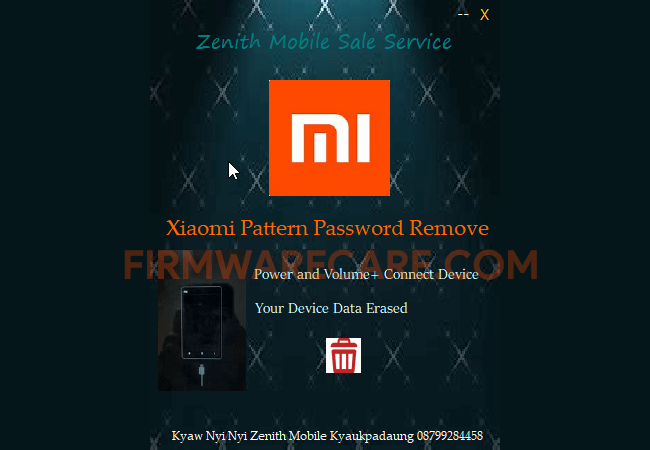 Xiaomi Pattern Password Remove Tool is a very useful tool in case you forget your screen lock pattern or pin to remove or reset the lock from your Xiaomi smart phone. In the process of removing pattern lock from your device, your data might be lost. It supports almost all models of Xiaomi. In order to use the Xioami Pattern Password Remove Application, you need to install the Universal ADB Driver on your computer. [*] Compatibility: The Xioami Pattern Password Remove Application runs perfectly on Windows XP, Windows Vista, Windows 7, Windows 8, Windows 8.1 and Windows 10 (32 bit and 64 bit). [*] Credits: Xioami Pattern Password Remove Application is created and distributed by Kyaw Nyi Nyi (developer). So, full credits goes to Kyaw Nyi Nyi (developer) for sharing the tool for free.